Multitouch, Microsoft Surface and NUI Ideas. Microsoft Surface Financial Services Application - Razorfish Demo from razorfish - emerging experiences on Vimeo. Two key interactions in this app never passed these filters. As a result, they make the app very difficult to use. - Does this improve users lives or is it a gimmick? Changing Modes and Expanding the "Ring"
- While I get that it's useful to know more about my bank's services, why would I want to do it in a Surface Scatterview? I am certain that there was a lack of paper prototyping on this app. It's tempting to drop right into code on a project like this. The application is small. It looks simple and there are always painful budget constraints. Post mortems on over a dozen apps have confirmed that these are fuzzy headed arguments, at best. They consistently lead to cost over runs and usability nightmares 100% of the time. Designing for Surface isn't like designing for GUI. There aren't any standards. as a result, most new interactions don't work. Creating great, intuitive interfaces requires figuring out AND USER TESTING them BEFORE investing in code. I'll have to agree with you on this banking demo. There was another video where I saw someone explaining it, and it just seemed awkward to have to learn and remember the odd ways to navigate the application. How might you go about improving the UI or process? One thing that I did yesterday was draw out on paper different interface elements, like storyboards or screenshots, except some pieces were cut out so I could add and remove them as needed. Since NUI and multitouch can be very non-linear, you can't explore an interface with just a series of pictures. With paper and cutouts we can go through the scenarios for the app we're working on and use our fingers to see if touching this or that made sense. It really helps make the interface better, and was much quicker to prototype than code. The other critical part of the process is getting non-involved people (like my wife!) to comment on the mock-ups and tell me where something doesn't make sense. With that razorfish app, the worst part is the zoom manipulation for the ring. It fails the Surface UX guideline that says that you should not use generic system gestures, rather, you should manipulate the interface. What part of the interface hints that you should be able to zoom it, or double-tap on the ring to zoom out? Too complicated. One think I think is missing is a feel for the reasons a person might want to use the application. What circumstances would lead someone to this scenario? We really need to look at the bigger picture. The first step is to carefully observe how and where people get information for financial planning in the "real world". What is their motivation to obtain this knowledge? Is it something that is influenced by others, such as a parent or spouse? Is it something that is encouraged by word-of-mouth by a friend or coworker? For example, when I was at the bank with my mother a few months ago, I noticed that there were several flat panel displays over each teller's station. A larger display was situated in a waiting area that also offered a variety of books, magazines, and pamphlets about financial planning. I noticed that there were people who were at the bank with others- a friend, a spouse, or an elderly relative. Some pairs of people appeared to be looking at pamphlets together. From time-to-time, the video running on the main display focused on financial information. In my mind, I imagined that a multi-touch table could replace the table that was in the center of the grouping of chairs in the waiting area, and thought about how it might work. A useful application would help pave the way for a face-to-face meeting with one of the bank's representatives. A similar application, perhaps running on a TouchSmart or touch-enabled tablet PC in the banker's office would also be useful. 1. Why should customers give a !@#$@?? The point of this demo is to eliminate a "receptionist" whose job is to direct customers to the right services and sales staff. Somehow, in the search to save money, the customer's needs were forgotten. Why would a system like this be worth learning? How could a multitouch system benefit us as customers? 2. Surface is unlikely to work as a point solution at retail. The environment, signage and service system all impact adoption, usefulness and usability. Attractor - This should not be "in your face". A step up from the Ambient mode, the Attractor mode would have a few hooks designed to please and entice the user/customer to poke around and explore. The Attractor mode might have some "how and why" interactive content subtly displayed. Informational- an overview or survey, could incorporate some "adaptive advisor" programming. Collaborative mode- between two or more people around the application, and/or including others who are remotely located, depending on the user's/application's purpose. "Save and Send" mode - a means of saving key artifacts of the interactive session, either to one's mobile device, or via the web to an e-mail address or repository that can be access from home or elsewhere, to a spouse or friend, or to a representative of the bank/store/company etc. 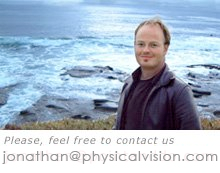 Jonathan provides independent consulting on multitouch product strategy, design and development. He identifies and produces integrated software/hardware products that grow revenue, streamline operations and differentiate brands. Most recently, he was an embedded consultant at Microsoft Surface where he helped develop best practices for Natural User Interfaces.